Running belts come in very handy when you need to bring a few things for your short run. This special gear is useful not only for running but also for walking, jogging, cycling, hiking, traveling, and strolling. 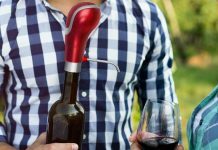 It keeps all your small essentials from falling and bouncing because it is closely attached to your body. It also allows even distribution of weight, giving you more comfort during movement. After careful research and product testing, we are giving the best running belt in today’s market. 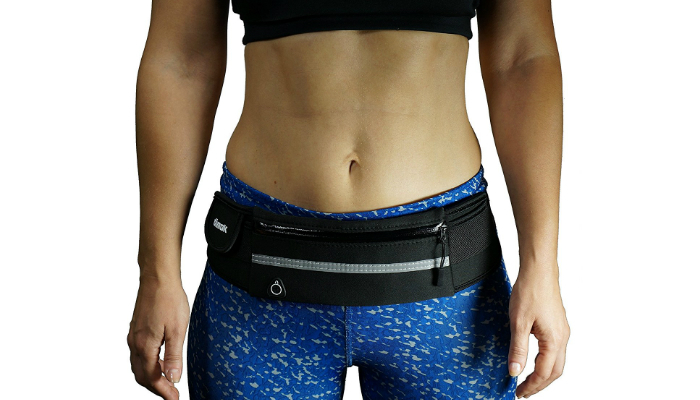 Level Terrain FlipBelt has a unique design, separating it from the typical look of running belts that makes them look like fanny packs. You just need to flip it so that it closes perfectly to lock all your essentials inside. 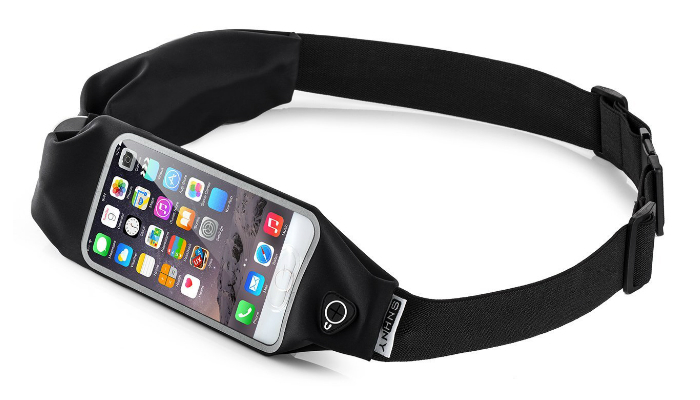 This smart design leads to a running belt that really looks like a belt. Since this product wraps the waist tightly, it ensures to resist moisture well by drying it fast. Being made of MicroPoly and Lycra materials, it stays soft to prevent irritating your skin. Another feature that makes it a must-have for night runners is the reflective detailing for visibility in the dark. Sport2People Fanny Pack Fitness Gear Hands Free Workout Reflective Running Belt is waterproof from its overall material all the way to its zippers. It makes sure that water will not seep through the zigzag gaps. 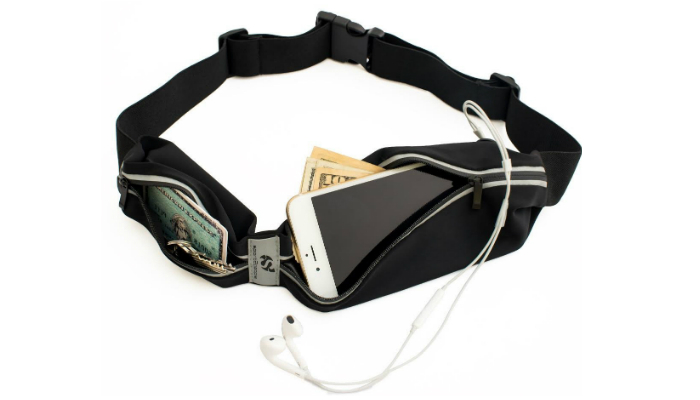 To prevent dropping stuff just because you want to get something from one compartment, this running belt has two pockets so you can organize your phone, cards, keys and other small necessities. If you are still using wired earphones for running, then you are in for a treat with this product. It has a special hole for the earphones’ cords. 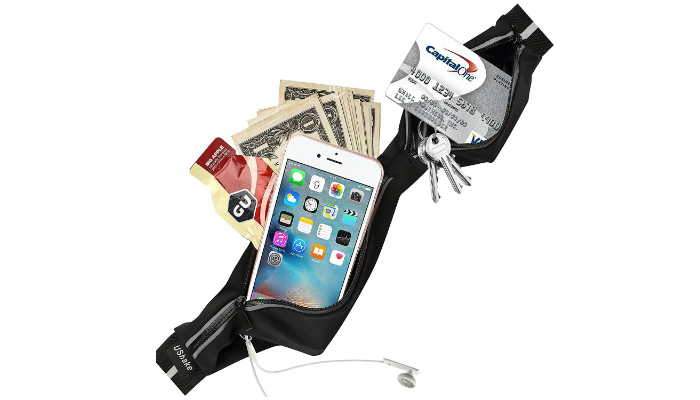 Because of the ultimate safety it brings for your essentials, it is also ideal to use when you are in a crowd during concerts and sports events. Dimok Water Resistant Adjustable Fitness Waist Pack Running Belt is not only great for daily runs. It is also perfect for people with a busy lifestyle, always having errands to accomplish. Shopping while bringing a bag can be such a hassle, especially during checkout wherein you may take a minute just to fish for your wallet. 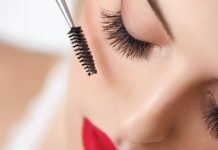 That will never happen if you are using this product. 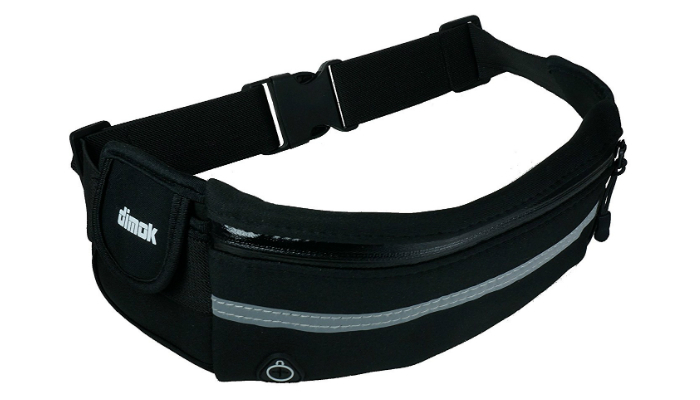 Regarding its adjustability, this running belt can fit waists up to 49 inches. Lastly, it is machine washable for easier cleaning. SNHNY Top Fit Comfortable Running Belt is extremely lightweight for comfier runs. It is made of tough materials for durability. It is not vulnerable to abrasion, preventing it from having holes and tears that affect the water-resistant feature of this product. That’s why this running belt is also perfect for hiking or climbing rough terrain. 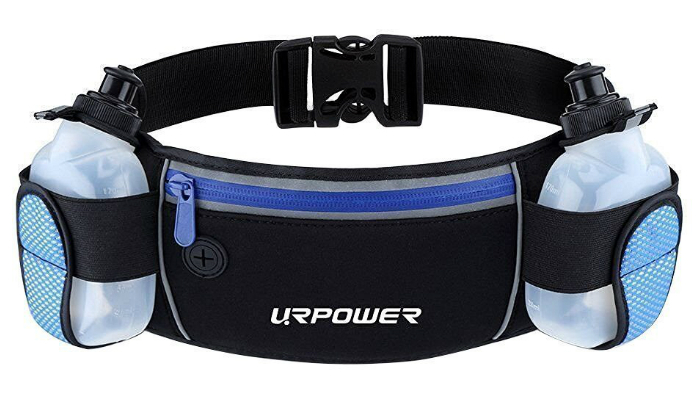 URPOWER Multifunctional Water Resistant Waist Bag Running Belt takes it up a notch with its own two water bottles that can be attached to its special holders, one on each side for balance. Although the bottles are small, both are still enough to hydrate you unless it is a long run. Besides, there are already a lot of studies proving that drinking too much water while running is bad for your body. UShake Fitness Gear Bounce Free Workout Reflective Fanny Pack Running Belt is made of breathable nylon and Lycra materials to prevent you from feeling hot around your waist because of the tightness. Despite its metal zippers, they will not make annoying jingling sounds while you run. Why? Their design is far different from the usual. The zippers are small, slim, and far from each other. This product comes in unisex colors for the benefit of both men and women. Most running belts are usually made of synthetic materials. Nylon, Lycra, and neoprene are the most popular materials for this type of belt. Lycra has become one of the most favorite choices because of its breathability, durability, and inexpensiveness compared to other materials. It elongates well and is resistant to water and sweat, perfect for working out. Meanwhile, nylon is a type of polymer synthetic material that is also known for its durability and strength. It has high resistance to drastic weather changes. It is quite flexible, too. Neoprene, on the other hand, is a soft and flexible synthetic rubber material that is elastic and non-slip to prevent the belt from chafing and twisting during the run. 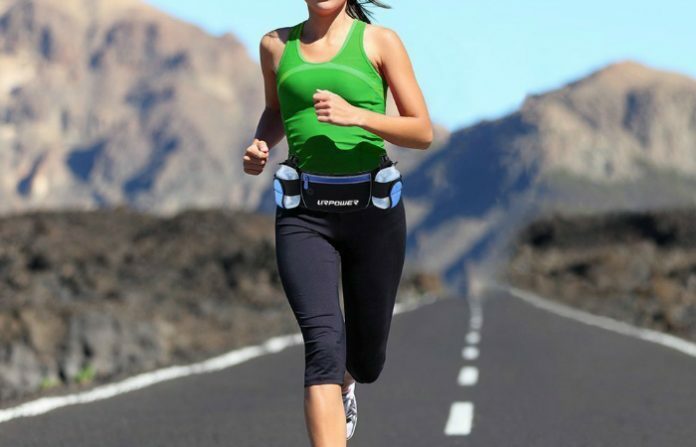 Running belts made of this material are often light, thick, and resistant to tear, wear and deformation. They can also be waterproof and even tough to withstand heat, perfect for outdoor exposure. Pocket space is a crucial thing to consider in choosing the best running belt for your lifestyle. It represents the main purpose of running belts – keeping your essentials. Pockets must securely store your phone and other stuff like medicines, wallet, cards, and keys while ensuring that everything inside will not bounce and rattle. It is important to keep your necessities at reach while running for safety purposes. In addition, you might need a running belt that can fit water bottles. Some products have their own water bottles since regular ones are too bulky for the waist. The downside is that these bottles are usually small, the only ideal for short runs. So, the best thing you can do if you like to take long runs is buy a running backpack instead of a belt. Knowing your waistline measurement obviously helps if you want a running belt that will stay fixed around your waist. Most running belts have adjustable straps that can be adjusted from 27 to 40 inches. Meanwhile, hydration belts hold water bottles, so they must have a snug and comfortable fit since they transfer the weight around the pelvis. Perfect fit is important because if your running belt bounces or swings too much, you might hurt yourself. 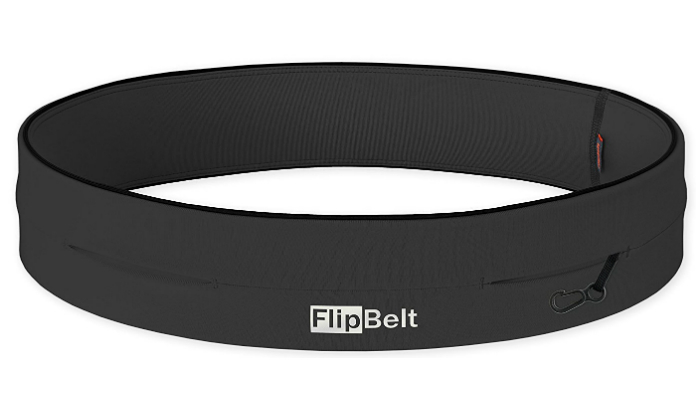 A bouncing belt also affects the rhythm of your run, distracting you until you are forced to cut short your activity. Running belts clearly come in different colors, ranging from dark to bright. Choosing the right color usually depends on personal preference. But, if you are a person who enjoys outdoor activities at night, select reflective colors. 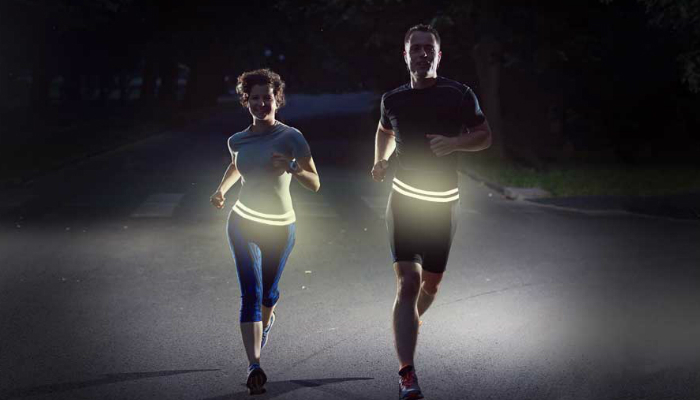 Running belts with reflective features are ideal for your safety during night runs. Vehicles can easily spot you if your belt and other running accessories such as sports watch and wireless headphones shine through the headlights. We selected Level Terrain FlipBelt as our top product because it is stylish, innovative, effective in securing small objects, moisture-resistant, gentle to the skin, and reflective. In choosing the best running belt for your outdoor activities, it is important to consider its material, pockets, fit, and reflective quality. It should be made of comfortable yet tough materials, have enough space for all your essentials, fit your waist perfectly, and visible at night. If you are looking for more products that can complete your gear for your daily runs, then check out our take on the best headband for running, best reflective athletic socks and workout shorts made for running. To know more about outdoor safety, learn about the things you should wear as a runner.